The Tradition of this church is mainly Anglo Catholic and the Mass is celebrated every day of the week, except Thursday and Saturday. Each Sunday Sung Mass at 11.00 am is celebrated which lasts just over an hour. Holy Trinity is a Resolution B Parish. Incense is used on the third and fifth Sunday of the month and Evensong and Benediction is observed on the third Sunday (3.00 p.m. November to March, 6.00 p.m. April to October). The Great Feasts are celebrated in Holy Trinity occasionally with High Mass. Holy Trinity benefits from having its own Church Hall a few hundred yards away in the village allowing for a full social life in the Church. During the summer months, July to September, our Organist arranges a series of Organ Recitals by well known local musicians which occur weekly at lunchtime on Wednesdays. The Parish has a successful Evening Mothers' Union which meets monthly. An active Walsingham Cell has a programme of monthly meetings in church and there is a long established Men's Society. Please contact the Churchwardens for more information. 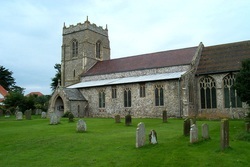 The church sits on a rise above the coast road and is a typical long flint and stone building of the 12th Century. The south aisle has stepped two-light 15th Century windows, the chancel two very big Perpendicular windows. The two-light west window is also 14th Century. The north aisle with its Y-shaped tracery windows may be earlier. The tower was begun in the 13th Century and finished in the 14th and although not as tall as some in the county it rises prominently in view on the road from Cromer. The parapet has four small pinnacles and bell openings with Y tracery on a circular shaft. There is one bell of 1715 with the name Thomas Newman on it. "THEY WERE A WALL UNTO US BOTH BY NIGHT AND DAY"
The attractive Victorian lychgate has been moved back from the busy main road and has the carved inscription "O enter into His gates with thanksgiving and into His courts with praise ..... be thankful unto Him". The calvary in the churchyard is a memorial to Felix Hackett Matthews, for 45 years Rector of the Parish, who died in 1964. The figure is a fibreglass replacement for the original which was vandalised in the 1970s. On the south aisle window-corbels are some carved heads, now quite eroded. They depict, from west to east, a lady, a knight, animals, a queen and a king. Also, under the gable of the south aisle, are two grotesques, a man's head and a man pulling his mouth wide open. The old porch has a blocked niche above the entrance. On the east buttress are the remains of a "mass-clock" with the metal base of the gnomon still embedded in the stone. The Victorian door has some fine floriated ironwork, and on each side a carved head, one a bishop, one a queen. The interior, which was extensively restored in 1854 and 1886, is wide and light with a mixture of old and new pamment flooring in terracotta and ochre. The restorations replaced most of the window traceries and the roofs. There are two aisles with four-bay arcades separated by octagonal piers with double-chamfered arches. Just by the door is an old stone of the 17th Century set sideways with very worn lettering, found there in 1963. There is another outside the porch. The octagonal font is 14th Century with small ogee-headed panels. The cover, a memorial to Kay Connell who died in 1964, was designed by Cecil Upcher. In the chancel there are carved sedilia and a decorated six-petal piscine retaining its recess for the sacred vessels. The church plate contains a medieval paten. In the choir, some old poppyhead carvings have been grafted onto the Victorian pews of 1886. Though rather battered, one can make out a medieval lady, a merchant, various seedheads, and a monstrous face with its tongue out. Poppyhead is not a reference to flowers, but supposed to be from a nautical term puppis or popeys = poop, the raised deck on the stern of a ship. The Victorian carved pews and chancel rail are quite restrained. There are attractive iron hinges on the altar rail. There are fragments of old glass in the south choir tracery. The five-light east window was designed by Edward Frampton, and was inserted in 1896. It shows the Ascension of our Lord, with vigorous drawing and strong composition. His also are the south chancel windows of St. George and St. Cecilia, after 1896, and the south aisle window of the Resurrection, 1904, which is rather dark. Some Art & Crafts influence is seen in his window at the east end of the south aisle, 1911, where St. Francis preaches to the birds. In the north aisle are St. Hilary and St. Stephen, 1938, St. Elizabeth with the child John the Baptist, and our Lady, 1954, by G. Maile of London. The easternmost window of this aisle is by Harry Stammers, 1959, in a simple "modern" style typical of its date. It depicts people in various historical costumes, and is signed with his symbol of a ship's wheel and an "S". The west windows of the aisles were reglazed in more modern times. The figures of two apostles, St. Peter and St. John, 1850s, were taken from the tower window in 1963 and inserted here in 1989. They are by J. Grant of Costessey. The roundels show a pelican and the Agnus Dei. Two other roundels, the Trinity and the Star of David, were lost during the reglazing. The first organ was installed here in 1865. Built by Mark Noble, it was transferred to Aylmerton in 1907. The second organ, by Norman & Beard, was larger (and therefore better!). It went to Thornington in Essex in 1923. A third organ was then built by William Middleton of Norwich. The present organ was built in 1959 by Williamson and Hyatt of Trunch. At that time it cost £2,300. There is a total of 441 pipes. In 2000 a new electronic console was installed but the sound still comes from the original pipes, set high on the west wall.